I became memorized by the the flames of the fire. The fire dances. My formal photography training was 15 years ago, and it was about “seeing the light”. Light reflection is a beautiful thing. So, as I was sitting on my deck, I noticed how the glass beads looked as though they were glistening because of the flames of the fire……….sometimes as a photographer it is hard to still still. Funny thing is that this pretty “lamp” was a citronella candle. Everything in life can be a creative moment. 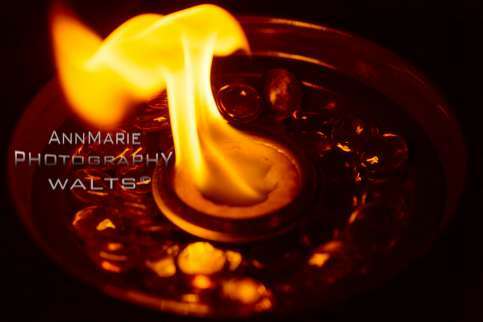 The interesting creative aspect that I experienced shooting the flames, was how the burning energy moved. Not to mention the array of colors. It was like it was dancing. My range of professional photography skills is quite eclectic & technical.